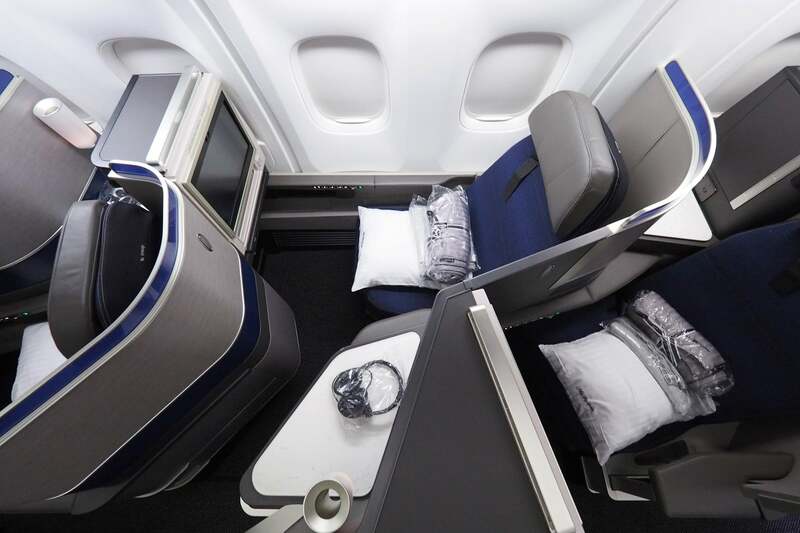 Polaris on United’s retrofitted 767 may just be the very best business-class option for crossing the Atlantic. The Pros: Loads of privacy, comfortable seat, great amenities and a completely refurbished cabin. 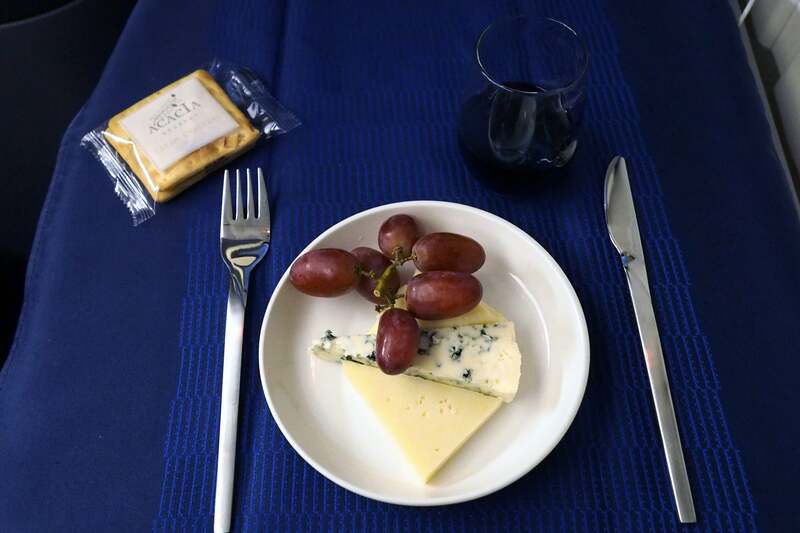 The Cons: Sluggish meal service, there’s only one 767 flying with the new seat right now. 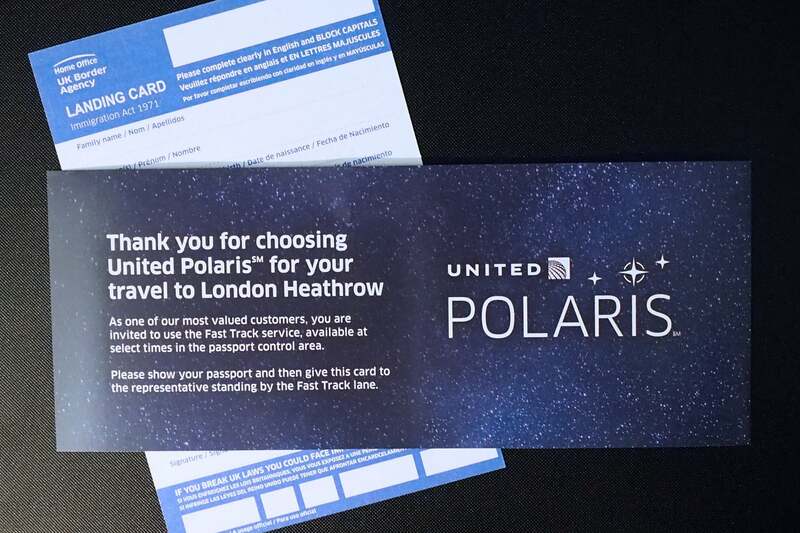 If you’ve flown United this year, you’ve probably see the airline’s Polaris branding. 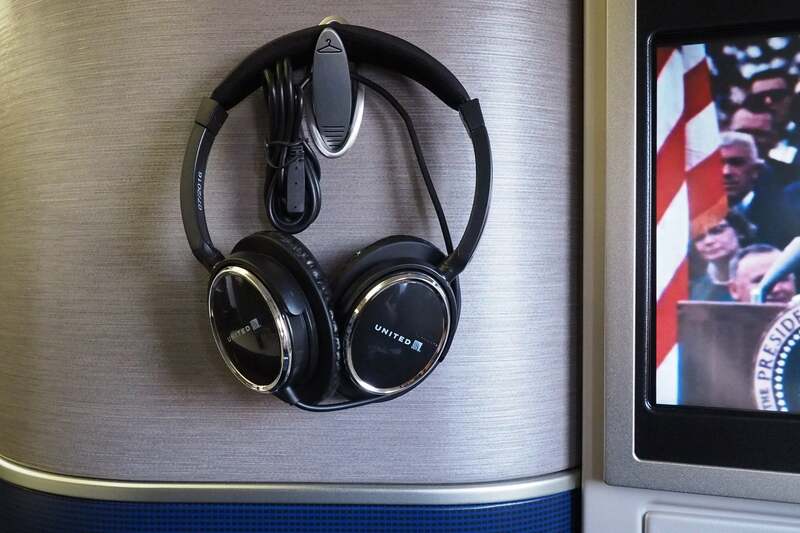 It’s everywhere — on United’s website, on the planes, in the airport terminals and even plastered along the walls of the jet bridge. 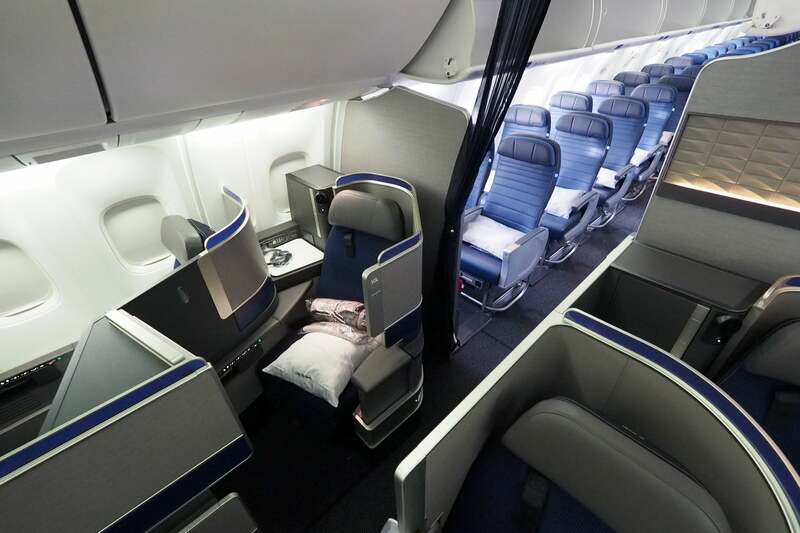 While the advertisements have served to build a ton of awareness around United’s new business-class brand, they’ve also caused tremendous confusion, since until now, United’s latest and greatest seats were only available on its 14 777-300ERs. As of Friday, though, the first retrofitted aircraft is now in service. 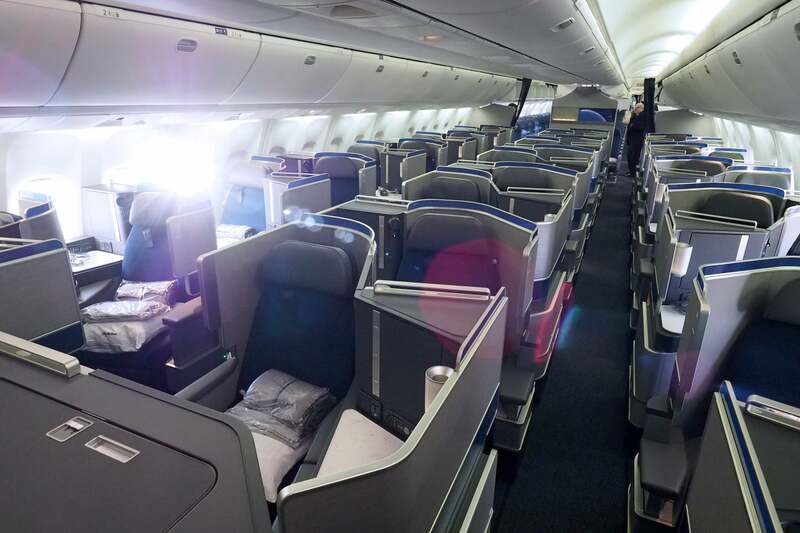 I joined its inaugural flight from Newark to London last night, and found both cabins to be very impressive — I’m still in awe that this is a 26-year-old bird. I’d been monitoring this particular 767 daily ever since I learned that United had begun the retrofit process back in May. N644UA, a 767-300ER that’s been flying for United since 1991, spent four months on the ground in Hong Kong, where it underwent a complete cabin overhaul. That’s an awfully long time to have an aircraft out of service, but as you’ll see below, it was certainly worth the wait. Once I saw that this particular plane had made its way from Hong Kong to Honolulu and on to San Francisco, I began refreshing the aircraft status page much more frequently, hoping to catch a route assignment as soon as it popped up. 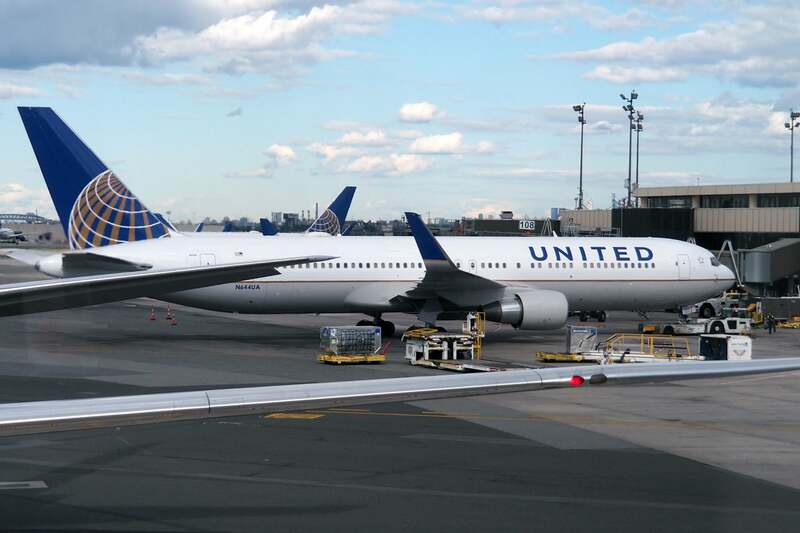 Ultimately, the plane ended up on a ferry flight to Newark on Wednesday night, and late Thursday night I caught that it had been assigned to operate Friday’s first Newark-London redeye, United Flight 110. 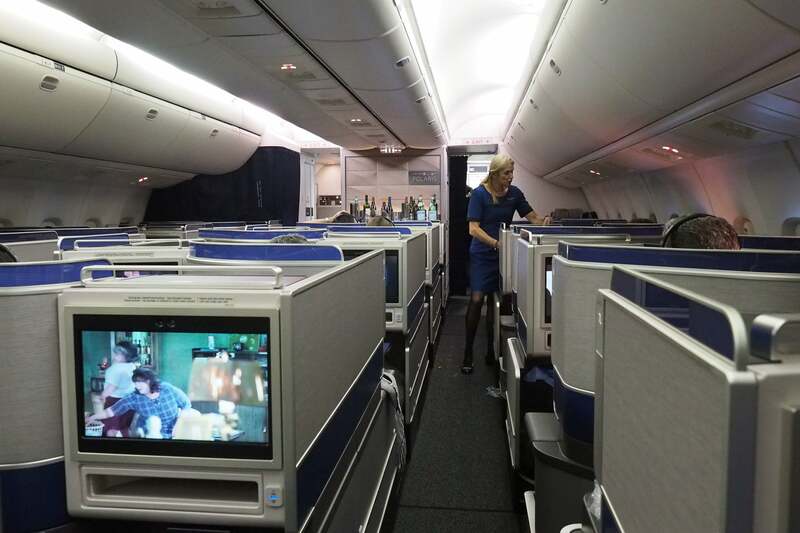 Fortunately, there were still several business-class seats open at the time, so I booked a W-class round-trip for $1,104, applied two of my Premier 1K Global Premier Upgrades and paid the additional $100 premium-cabin Air Passenger Duty for the UK departure. I paid with my Platinum Card from American Express, earning 6,020 Membership Rewards points, worth $114. Additionally, as a Premier 1K member, I’ll earn 9,801 United miles, worth $147, bringing my total return to $261 and my net cost to $943. That’s still a bit pricey for an economy ticket to Europe, but I needed to book a more expensive W fare in order to be eligible for the upgrade. Note that because there’s only one retrofitted 767 currently flying, it’s impossible to predict which flight will have the new seats. It could end up flying any route already assigned to a 2-cabin 767, and United may not add the new plane in until a day or two before departure. 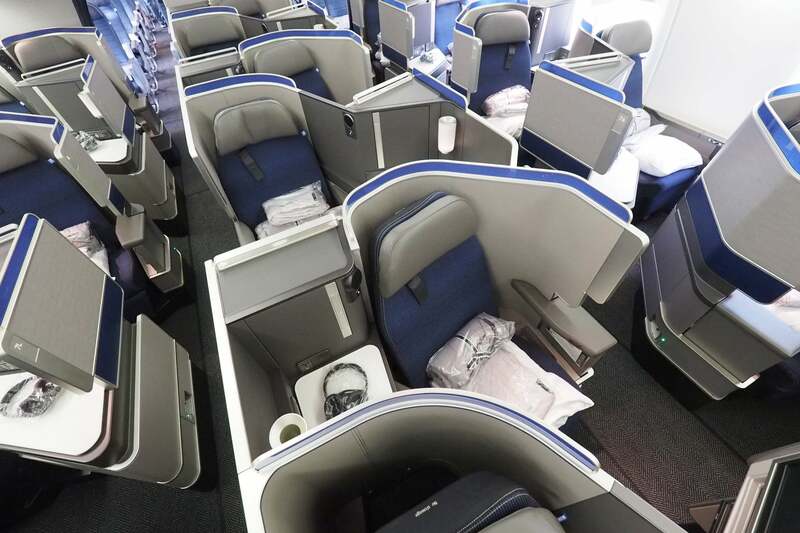 For more on this process, see Which of United’s 767s Will Get the New Polaris Seats? Well, first of all, UGH. Because I booked this flight less than 24 hours before departure, TSA flagged me for “random” security screening — yes, I got the dreaded SSSS, for my return flight as well. The experience ended up being even more unpleasant than I had feared, so stay tuned for a full report. Since I really needed some peace and quiet at that point, I didn’t visit a United Club on this trip — instead, I stopped by “Club Classified” near gate 120. I ended up only ordering a $4 pot of tea, but still received complimentary bottled water and an amuse-bouche. Unfortunately United’s Newark lounges are a bit of a mess at the moment. There’s a perfectly serviceable pop-up lounge available, but it’s nothing special. Meanwhile, the main lounge is under construction — it was unbearably crowded during my last visit. 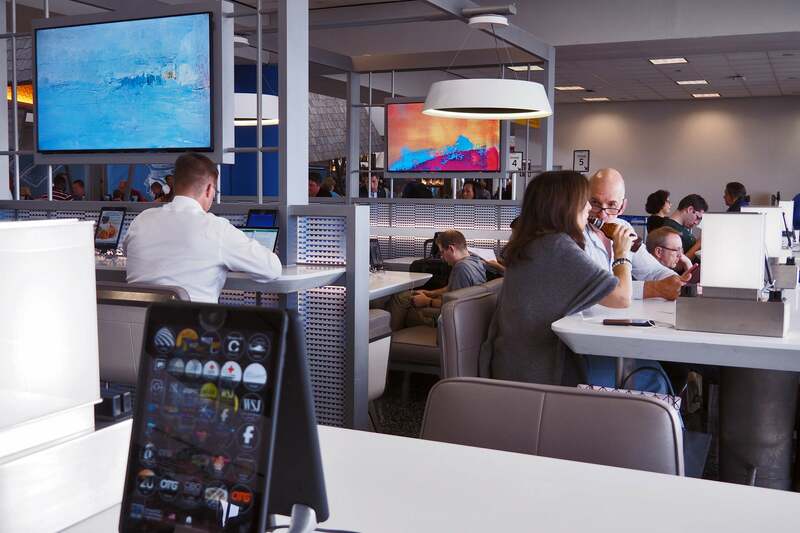 United’s currently building a Polaris Lounge — which I would have had access to prior to this flight — but it won’t open until next year. After a few minutes at Classified, I made my way to gate C108, where I was permitted to board early for photography. Our departure ended up being delayed by 30 minutes, due to heavy tailwinds that would bring us to London in just five hours and 56 minutes. Had we left on time, we would have arrived some 30 minutes before Heathrow’s 6:00am curfew, which would have required circling a bit before landing. Notably, the 6:45pm flight ended up beating us to the gate by six minutes — it’s worth keeping the curfew in mind when picking a flight, since ultimately a later option could arrive around the same time during periods of heavy tailwinds. I posted a separate cabin tour last night, including a detailed look at the Polaris section and economy, so I won’t go into much detail here. 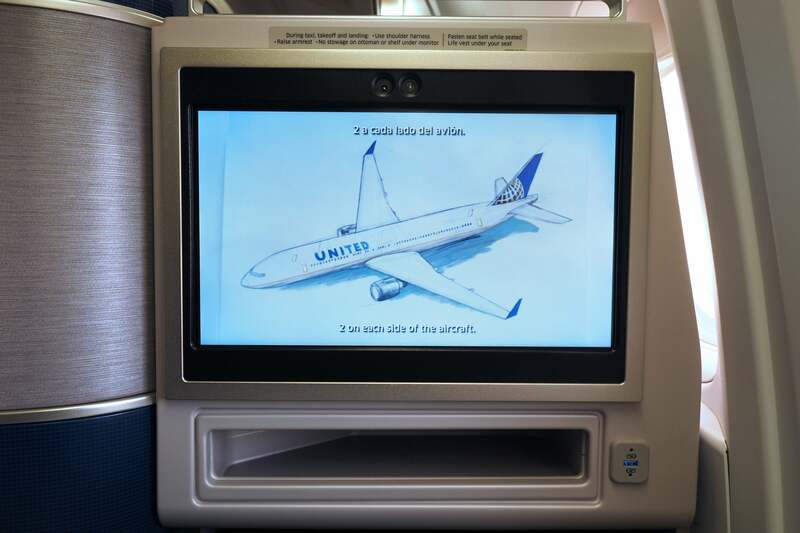 In short, the retrofitted 767-300ER maintains the 30 business-class seats installed on United’s variant with a 2-1-2 configuration, however on this plane, seats are arranged in a far superior 1-1-1. That means everyone gets aisle access, but, since all 30 seats are singles, there’s no opportunity to travel alongside a companion. I selected seat 9L for this flight, the last window-facing window seat in the cabin. Window seats in odd-numbered rows are ideal, since they’re separated from the aisle — compared to the seat behind me, 10L, below. I found 9L to be very private, which was especially useful when it came time to catch some shut-eye. You can adjust the seat using an intuitive control wheel — it’s also possible to make granular adjustments, but I didn’t have any trouble getting comfortable just by moving the wheel forward and back. I was surprised to see that the passenger seated in 7F had an inoperable control panel, though, especially since this was the very first post-retrofit flight on this plane. 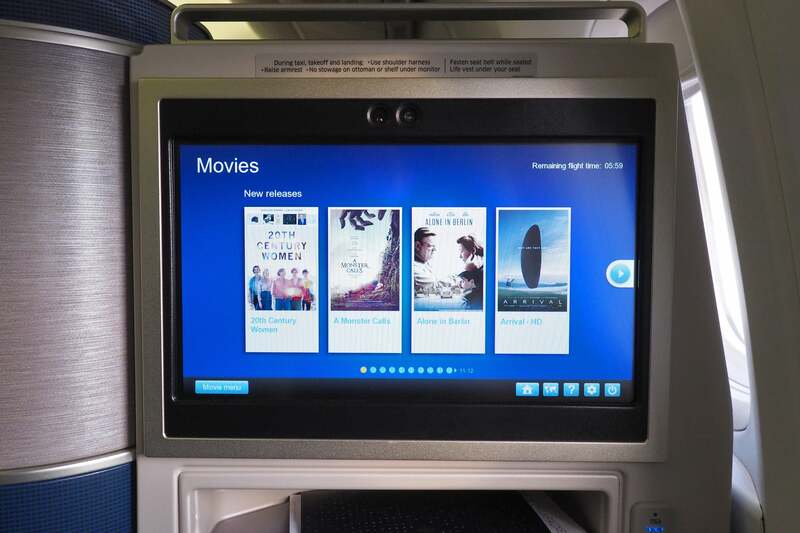 Each seat has a 15-inch HD touchscreen with loads of on-demand movies and TV shows. 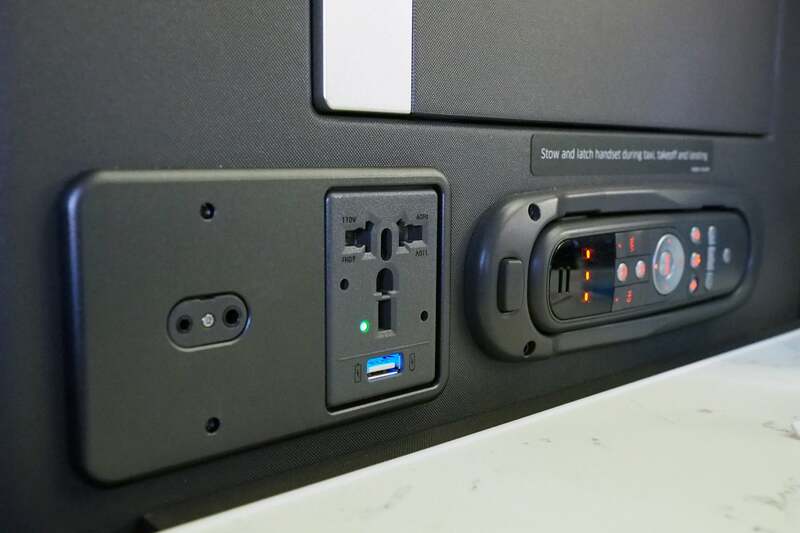 There’s a small storage shelf just below the TV — with a USB power port to the side, this is generally where I choose to store (and charge) my smartphone during Polaris flights. 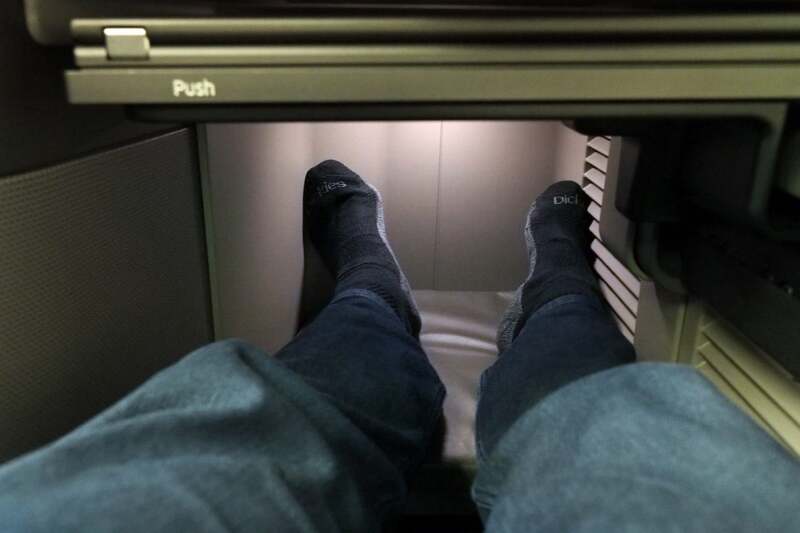 The slide-out tray table is located just below the “smartphone shelf,” followed by a sizable foot cubby — while you’ll have more room at bulkhead seats (as I’ll explore in a “where to sit” post next week), I didn’t have any issues with foot comfort in 9L. 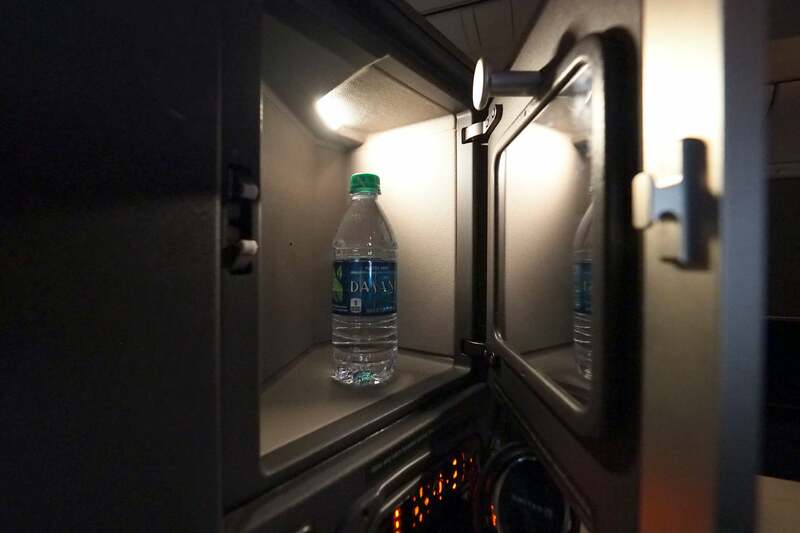 The other Polaris components are present here as well, including the pop-out LED light and sconce. Above the side table you’ll find a headphone jack, a universal power outlet, a second USB charging port (which wasn’t working at my seat) and a wired remote. There’s also a small storage cabinet — it isn’t large enough for a laptop, but my camera and other gear fit in there just fine. 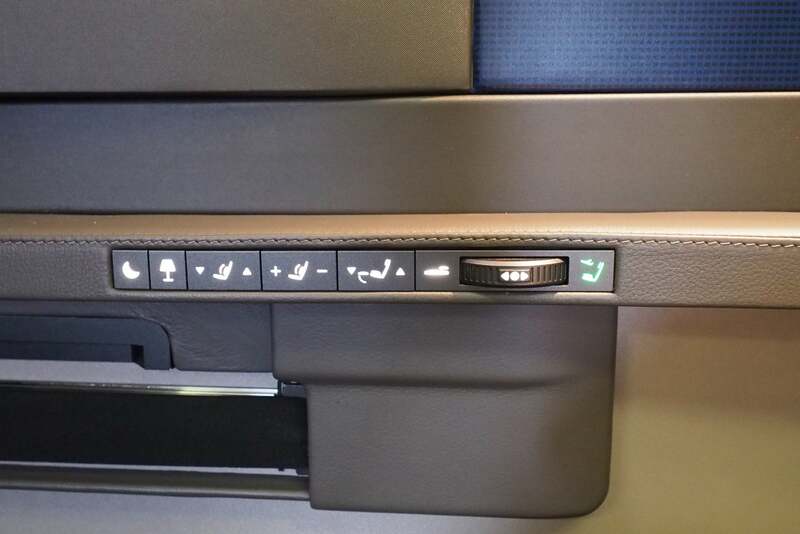 Finally, all seats have a nifty “do not disturb” sign, which you can illuminate by tapping a button on the control panel. 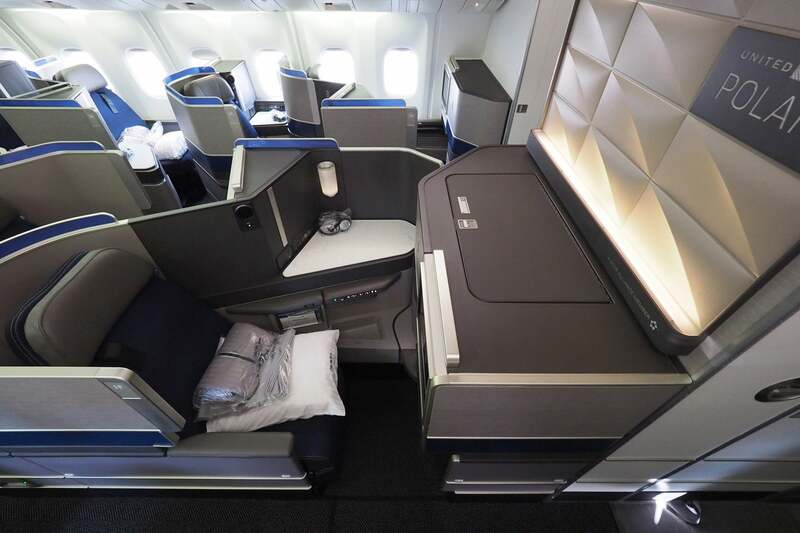 Of course, in addition to the new seat, all international flights also offer the Polaris “soft product,” which includes improved food and beverage offerings and Saks Fifth Avenue bedding. 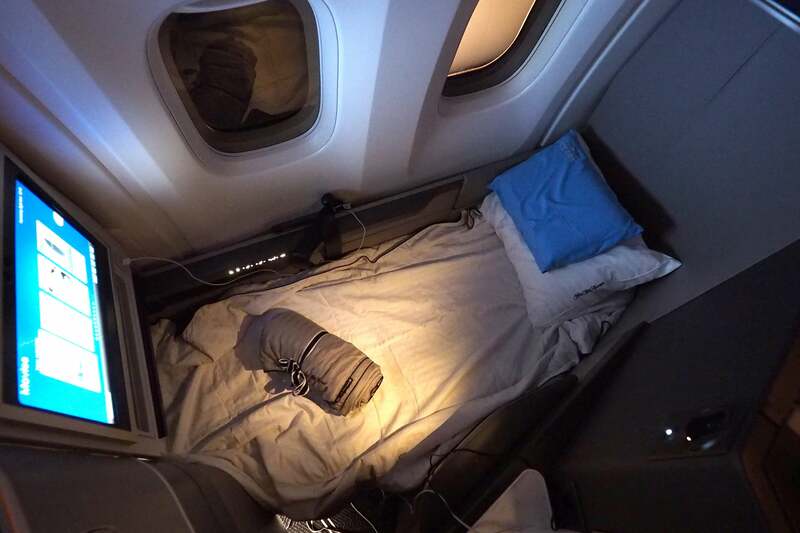 There’s a large pillow, a light blanket and a comforter waiting at each seat, and passengers can request gel pillows and mattress covers on all international flights, plus pajamas on United’s longest flights. Unfortunately the mattress covers hadn’t been boarded for this flight, but a flight attendant offered me an extra comforter instead, which did the trick. 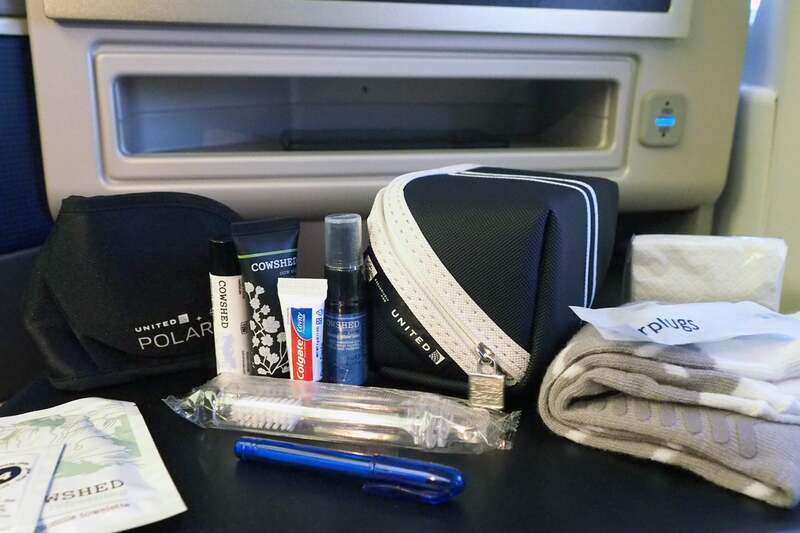 I also got United’s latest amenity kit, which sports all of the essentials (detailed in full here). There are also noice-canceling headphones — the quality is okay, but I much prefer a higher-end set, such as the Bose QuietComfort series. 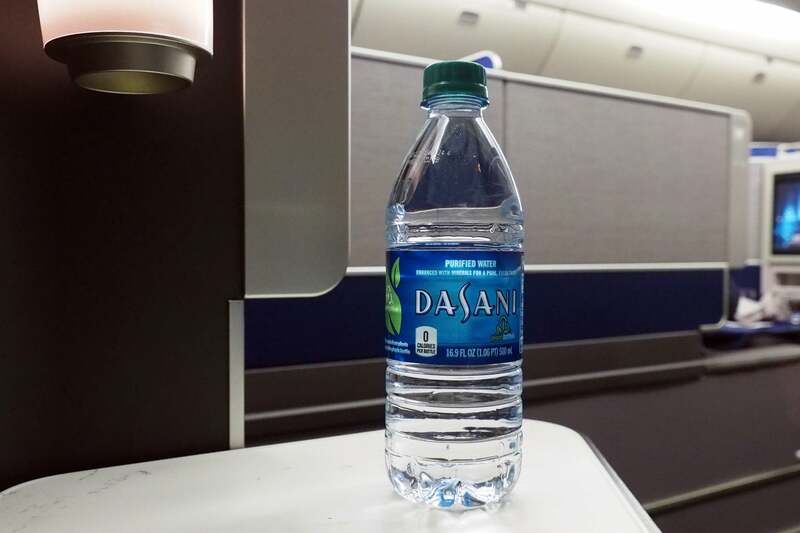 I also received the standard Dasani water bottle. Just before landing, the purser came through with landing and Fast Track cards, which included instructions for visiting the United Arrivals Lounge at Heathrow. 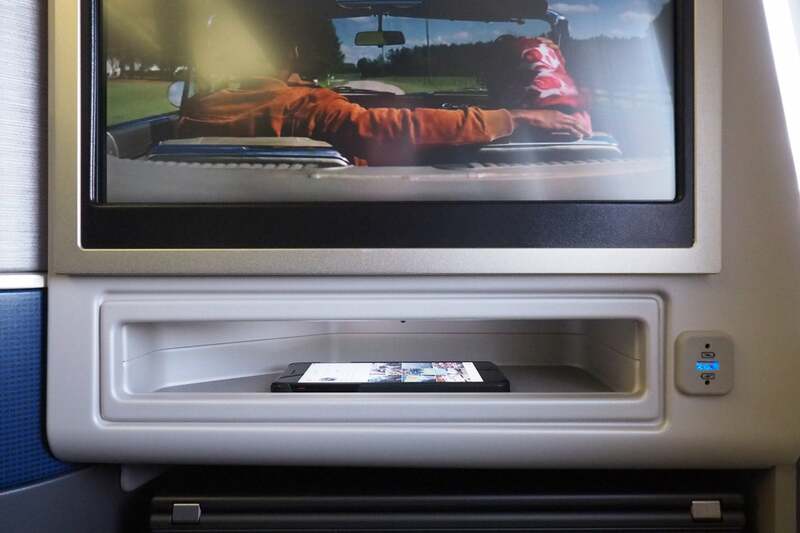 As I mentioned, each seat has a 15-inch HD in-flight entertainment system, with a range on on-demand entertainment. 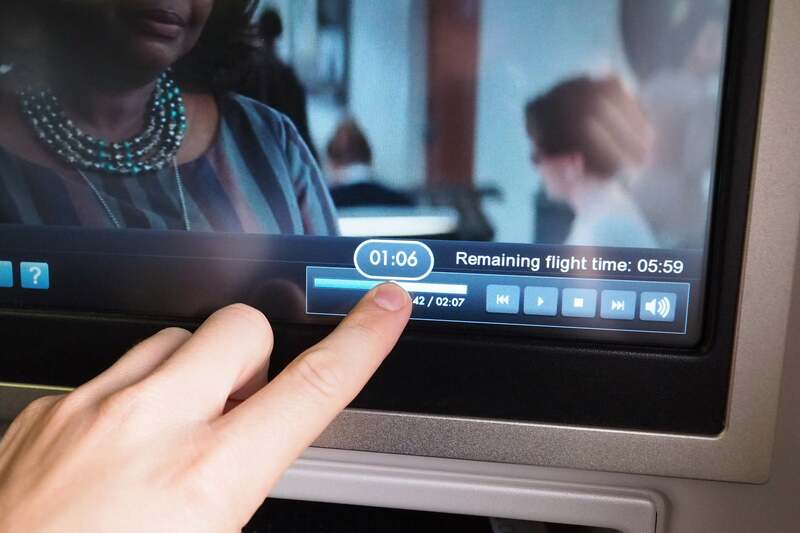 There’s a moving map, of course — I find United’s especially easy to use, since it’s very responsive and you can pinch, zoom and pan using your fingers. There are hundreds of movies and TV shows to choose from, including more than 50 (somewhat outdated) new releases. You can leave a program and later resume, or you can easily scroll to a particular spot by sliding the progress bar at the bottom — no more dealing with sluggish fast-forwarding to pick up where you left off. There’s Wi-Fi available as well, but it isn’t super speedy and seemed to cut out several times during the flight. Service was priced at $7.99 for one hour, $11.99 for two hours and $22.99 for the entire flight. You can pause and resume service as often as you’d like, so even a one-hour package should be sufficient if you just plan to check email off and on. 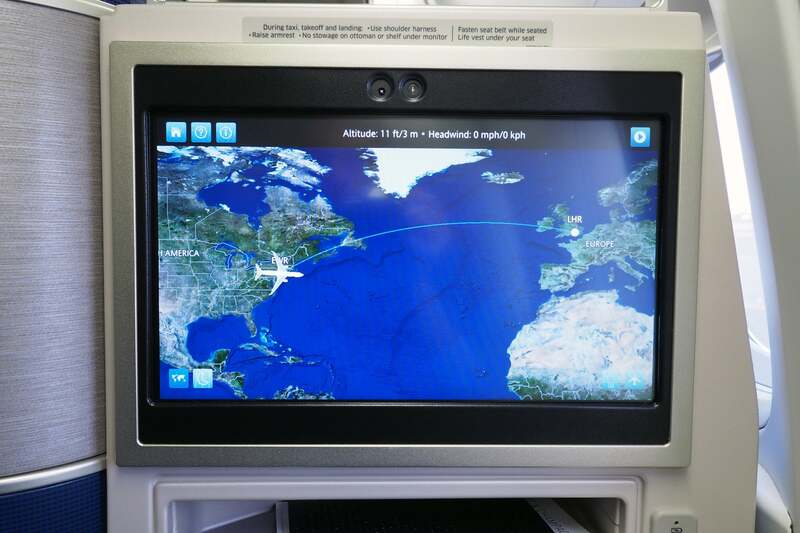 Additionally, this aircraft offers “Channel 9,” United’s live Air Traffic Control feed. The pilots can choose to disable it, and from my experience they usually do, though it was live on this particular flight. Well, you definitely won’t go hungry. 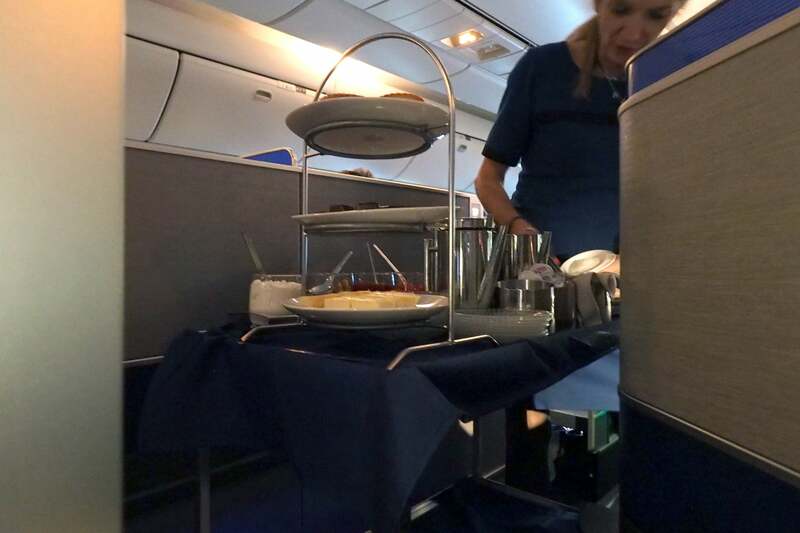 Unfortunately that means that there are many courses to get through, and depending on the crew, turbulence and other factors, you could easily end up halfway into a transatlantic flight before the first meal service is done. That was the case for this flight. 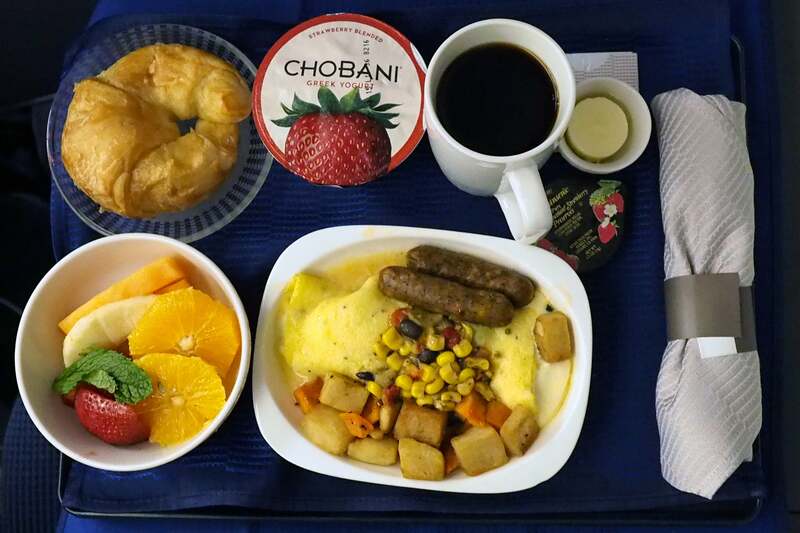 If you’re planning to sleep, I highly recommend eating before the flight or requesting “express dining,” where a flight attendant will deliver your meal all at once shortly after takeoff. 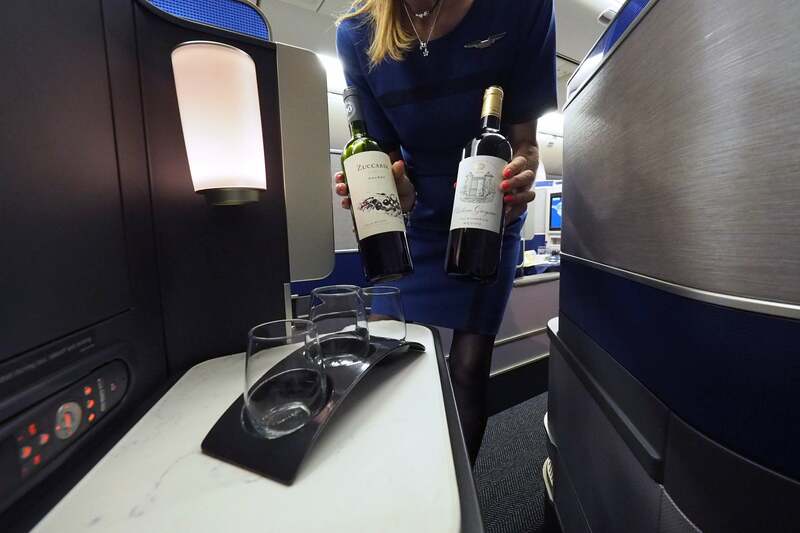 This flight’s culinary adventure began with an offer of Champagne, water or another beverage of choice prior to departure. 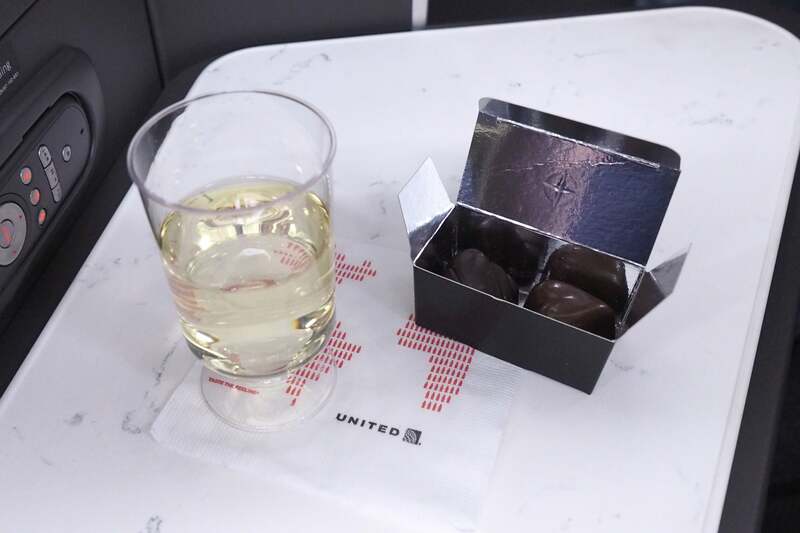 I ordered Champagne, which was served with a small Polaris-branded box of chocolates. I was also presented with the menu — it’s so large that I couldn’t fit it all into one shot. Missing below are the a-la-carte items, consisting of fresh fruit and other snacks, and the breakfast service, with a choice of a southwestern omelette or fresh seasonal fruit. The captain was expecting some turbulence right after takeoff and asked the flight attendants to remain seated. As a result, the purser didn’t end up stopping by for my order until 30 minutes after departure, at which point I ordered the spicy chicken, with the beef short rib as my backup. 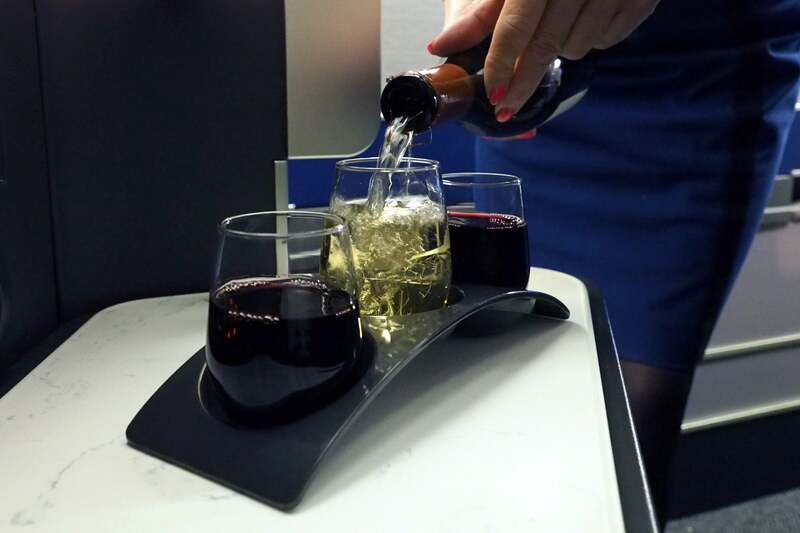 Then, an hour and 15 minutes into the flight (yes, really — it was that long), a flight attendant came by to take my drink order. I requested the wine tasting, with two reds and one white. 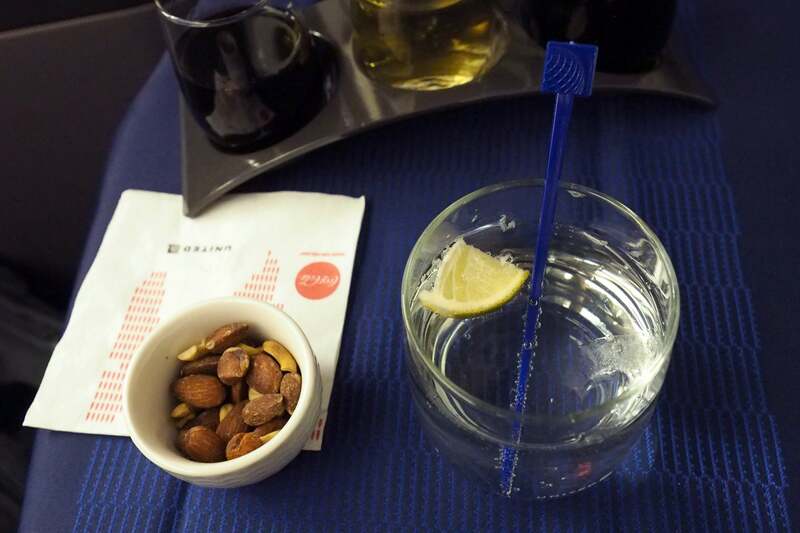 I was also offered some nuts (which weren’t warm) and my choice of sparkling or still water. 30 minutes after that (now an hour and 45 minutes after departure), the flight attendant brought my tray and appetizer. The bread wasn’t warm enough, but the salad was interesting and fresh. I also liked the tuna appetizer. My spicy chicken entree arrived two hours and 15 minutes into the flight, which is a bit crazy. 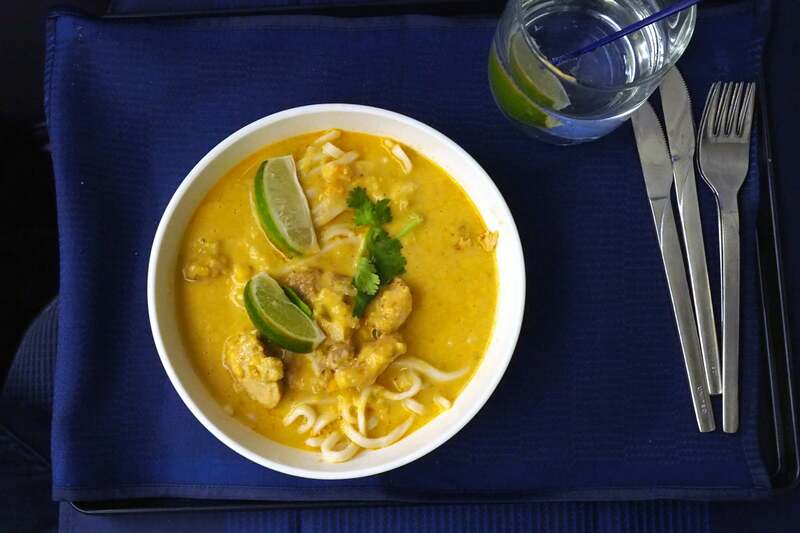 This ended up being nearly identical to the “Asian fusion chicken soup” TPG and I tried on the preview flight in February — I’m not sure why they switched up the name, but it was just as delicious as last time. Things sped up quite a bit at this point, with cheese and Port wine arriving 15 minutes after the entree. 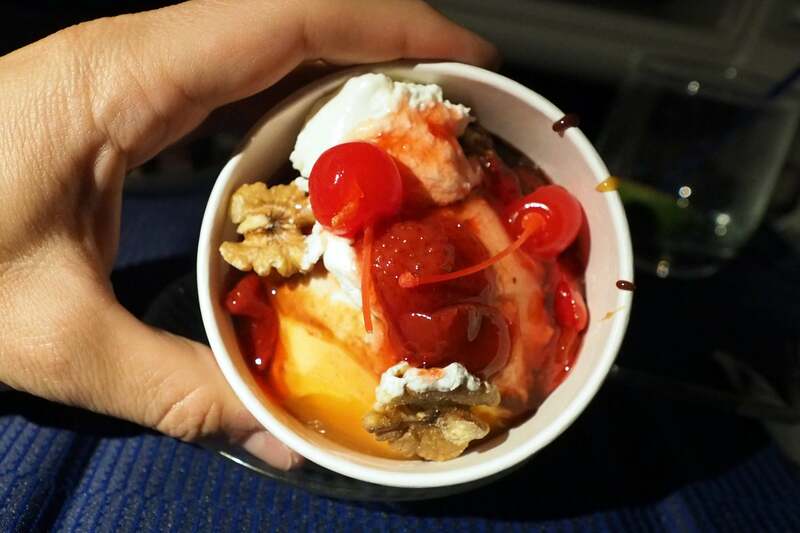 The dessert cart made an appearance a full three hours after departure. It was clear that the crew was getting acquainted with the new cabin, so I’m sure that slowed things down a bit. I ordered a sundae with “the works” and noticed that it came in the older paper bowl, rather than the plastic bowls I saw last week. 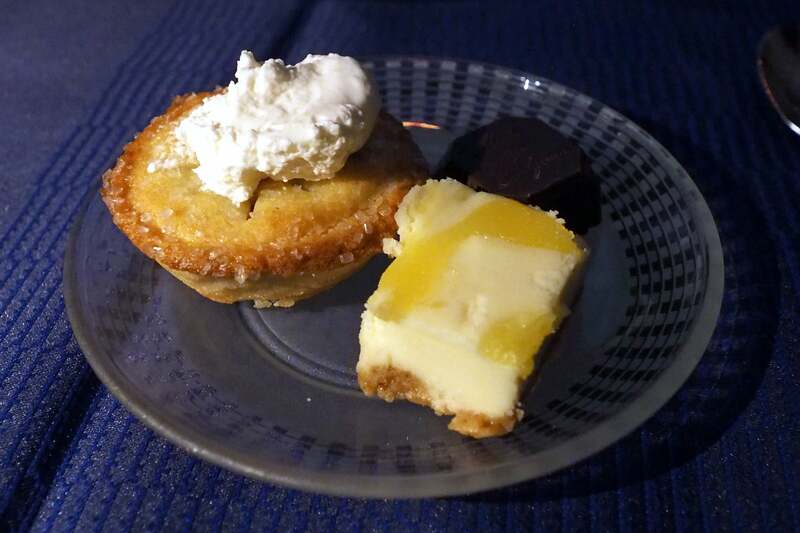 I also requested the other desserts, including a “warm” (not warm) cherry pie, a small piece of cheesecake and a chocolate. Everything tasted good but I only had room for a couple bites at that point. Because dinner took so long and the flight was so short, breakfast began less than two hours after dessert, or an hour before arrival. I missed the flight attendant the first time around, so I pressed my call button. 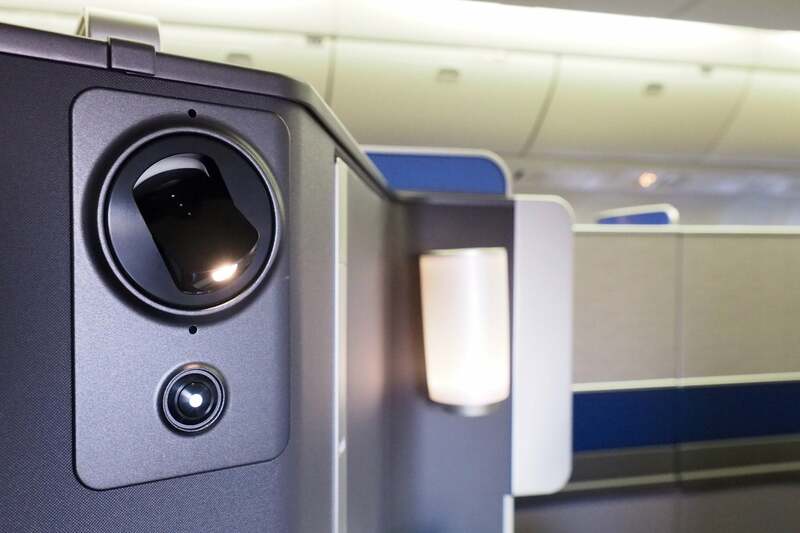 (The one issue with these seats being so private is that it’s nearly impossible to make eye contact with a flight attendant, so you really are dependent on the call button.) She didn’t spot it initially, apparently, so I pressed it again and she appeared right away. My breakfast was served just two minutes later — and it was outstanding, especially the omelette with spicy cheese. Having racked up many flights on United’s older 767-300s and -400ERs, it really is incredible to see what the airline has managed to do with such an old plane. 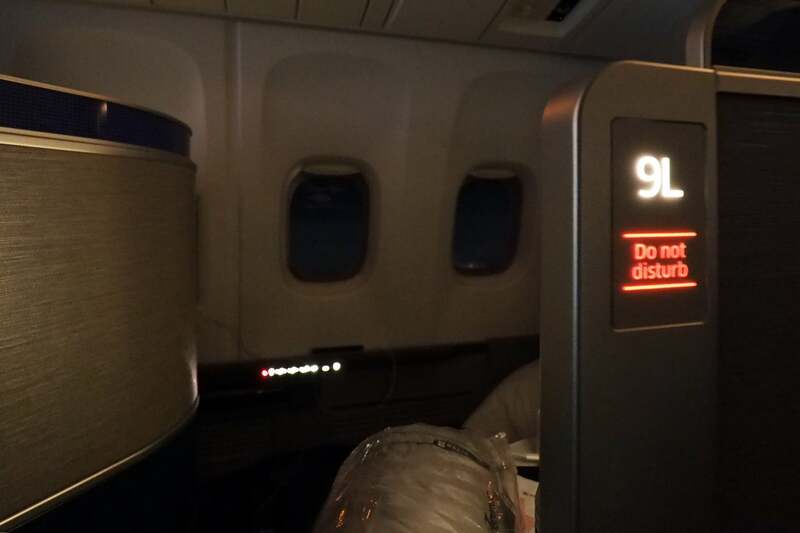 Passengers in both cabins definitely took note of the fresh interior — I wouldn’t have been surprised one bit if they thought this plane had been delivered from Boeing just days before. United still has a long ways to go when it comes to the Polaris rollout, but I’m glad to see the airline making a serious effort, moving these planes through the process at a regular clip. 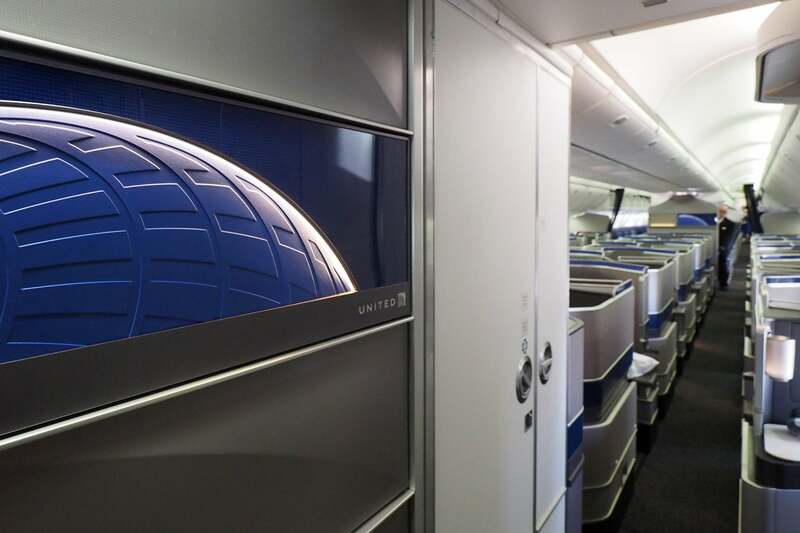 I love the new seat — I just hope it makes its way to United’s entire international fleet much sooner than anticipated. 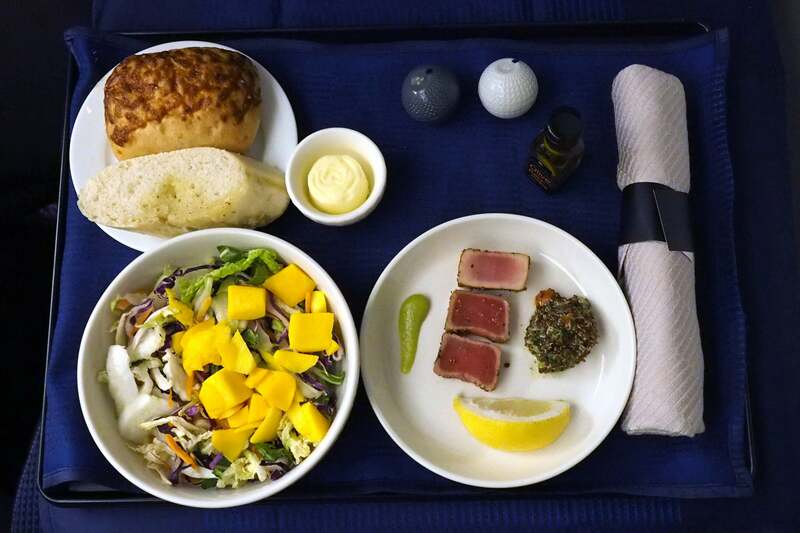 And the airline really needs to find a way to speed up the meal service, especially on such a short transatlantic flight. 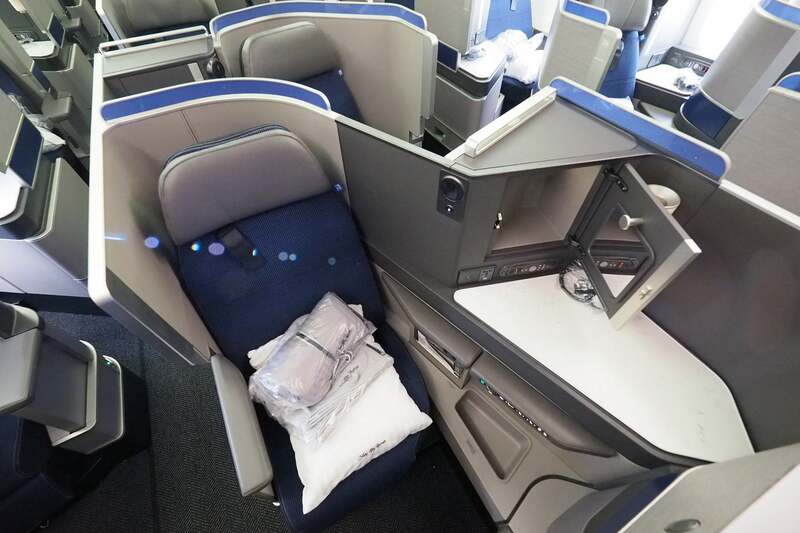 Which of United’s 767s Will Get the New Polaris Seats?